New Slots At Casino Heroes - Knight’s Keep and The Great Albini! Fancy a medieval adventure, a mystery full of magic, or a glitzy retro show? Then the newest slot additions on the Casino Hero website have it all. And you should waste no time to visit their site. In fact, the latest additions bring together everything a good game needs. So let’s explore them together! This month, SG Digital in collaboration with WMS invites players to join a medieval adventure with the release of Knight’s Keep. All and all, this game is an online adaptation of a slot you may have stumbled on, at your local brick and mortar casino. To sum up, the game has 6 reels, progressive rows, and 192 paylines. The special features include 25 Free Spins which you’ll play on a flip reel set. 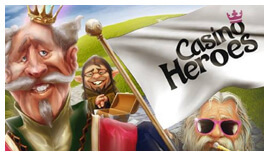 As you know, Casino Heroes is a gamified casino which already invites players to join a medieval-inspired adventure. So undoubtedly this new game will appeal to players who have a thing for gothic quests and big wins too! As you probably know, recently Microgaming released The Great Albini. As the slot’s name suggests, this game invites players to meet up with a great magician and to pocket big wins, up to 4,000x their stake. What’s more is that the new Foxium game also has excellent bonus features and 2 different game interfaces. You can find out more about this game by visiting Casino Heroes or simply by staying tune and reading our upcoming game review. And the last big release of this week at Casino Heroes is Relax gaming latest title, the Great Pigsby. This game will appeal to the more novice players who are seeking smooth and yet straightforward gameplay with crowd-pleasing features like stacked wilds, Free Spins and Re-Spins. These games have recently appeared in the lobby of Casino Heroes! So if you’d like to try them, you know where to find them! And the good news is that you can claim a casino bonus to play them too.